Im linking up with Visible Monday at Not Dead Yet Style. 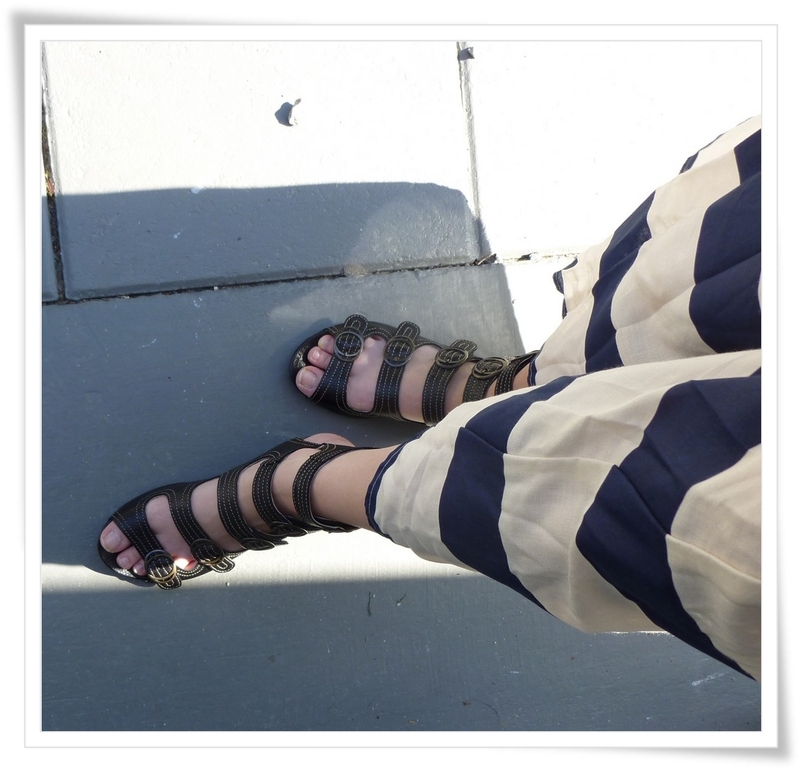 I love the striped skirt with the strappy sandals. Very pretty! Your skirt is just fantastic - I love the bold stripes and the shape of it. The gladiator sandals are very cool too. Great look top to toes! Thanks for linking up to Visible Monday. Ohhh... I like you more and more! :-) I also wore nautical the first day at the office (proofs soon at a blog close to you) and I also watched and liked the closing ceremony yesterday. Isn't it enough for you Norweigans to always beat us in the winter olympics? Congratulations to two gold medals, well done! The maxi and the top are fantastic! Sorry, but I have to keep this post short, since I need to buy the top from H&M NOW! I love everything about this look! From the maxi striped skirt, to the blouse cut outs, and the amazing sandals. I've almost broken over and ordered those (in blue) a number of times. I worried about the fit, but yours look great. Love the maxi striped skirt! I'm kinda into maxi and stripes these day! Very pretty! You look gorgeous, Izzy! I love the striped skirt and the cutouts on the top! I can't believe that top is from H&M, it's so lovely on you! The colour is just right with your amazing skirt! I watched the Olympics too - and sang along so loud that my daughter couldn't sleep! Did Denmark beat both Norway and Sweden this time? Red, white and blue, always a winning combination! Hello! It's Rosemary from England. I hope you had a great holiday. Lovely to see your striped skirt. I LOVE stripes. Isn't it great to have a bit of good weather? I love this look too, especially the bold skirt that blows in the wind. Doesn't that feel fantastic!? It makes me sad that men can't experience that same freedom of style... The first day back - you survived! Good job.